After 20 Years ! 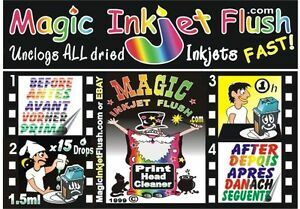 As professional recyclers we have also recycled most makes of Inkjets ! With MORE THAN 100 FULL COLOR photos. To help YOU if needed. will need to be soaked overnight. Inc. 220mls Quality Print Head Cleaner, Magic.